Living a Fit and Full Life: Swanson Vitamins New Probiotics are Just What You Need to Get Your Digestive Health in Check! Swanson Vitamins New Probiotics are Just What You Need to Get Your Digestive Health in Check! Swanson Vitamins cares about your family’s health and well-being. We’ve built our company around the philosophy that everybody deserves quality natural health products at affordable prices. New Swanson Probiotic for Digestive Health helps support digestion with 16 carefully selected strains so you can feel your best. Your digestive tract is a diverse ecosystem, home to billions of microorganisms. The “good ones,” known as probiotics, provide valuable support for healthy digestion, immune function and many other vital processes throughout the body. Probiotics help establish and maintain a healthy balance of bacteria in the GI tract by increasing the population of beneficial strains. Prebiotics, such as fructooligosaccharides (FOS), enhance this activity by nourishing probiotic organisms to ensure that they thrive. 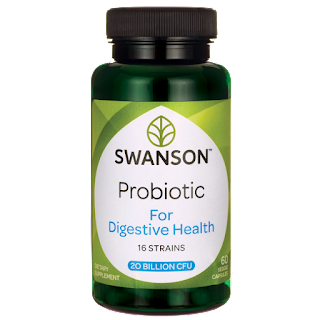 The 16 strains found in Swanson Probiotic for Digestive Health were carefully selected based on their specific roles in supporting digestive health. For example, it features 9 strains of Lactobacillus, including L. acidophilus, one of the most extensively researched strains when it comes to digestive health, and L. rhamnosus, which provides invaluable GI tract protection for travelers. Commonly found in fermented foods like sauerkraut and kefir, these lactic acid producing bacteria aid in the breakdown of lactose and other sugars, reducing gassiness to support intestinal comfort. The formula also includes five Bifidobacterium strains, which work in harmony with L. casei, L. reuteri, Streptococcus thermophilus and Lactococcus lactis to support digestive function throughout the alimentary canal. Combined they constitute a broad spectrum source of natural support for digestive health. 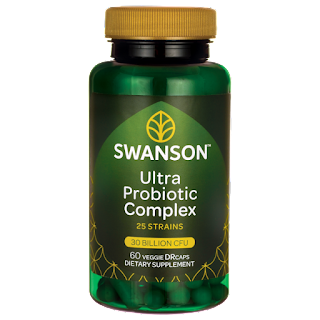 New Swanson Ultra Probiotic Complex is our most comprehensive formula for digestive and immune support. A healthy intestinal tract is a diverse ecosystem, home to billions of microorganisms. The “good ones,” known as probiotics, can have a wide range of beneficial effects, from promoting healthy digestion and GI tract function to supporting a strong immune system and mental and emotional wellness. That’s why more and more health professionals are emphasizing the importance of maintaining a healthy, diverse microbial balance in the gut as fundamental to a holistic wellness regimen. Swanson Ultra Probiotic Complex is the ultimate in broad-spectrum probiotic support, delivering 30 billion CFU from 25 carefully selected strains backed by solid science, including the famous Kyo-Dophilus® blend, seven species of Bifidobacterium and the probiotic yeast Saccharomyces boulardii—plus prebiotic fructooligosaccharides (FOS) to nourish them and help them thrive. It’s our most comprehensive supplement ever for supporting a healthy, bio-diverse gut biome. New Swanson Ultra Potency Probiotic is Swanson's most powerful probiotic formula to support digestive and immune health. Take your wellness regimen to the next level with our most powerful probiotic supplement ever! You eat right. You exercise regularly. Still, you can’t help wondering if there’s something that you’re missing—something more you can add to your health and wellness regimen for greater results. And there is. In fact, there are billions and billions of them. 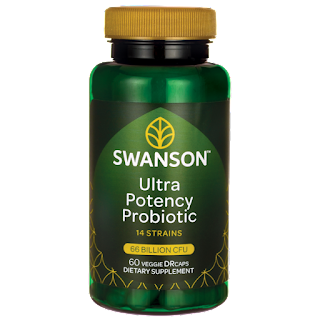 Swanson Ultra Potency Probiotic provides a complete probiotic profile with 66 billion CFU from 14 carefully selected strains including some of the most heavily researched and scientifically-backed strains, plus prebiotic NutraFlora® scFOS® to nourish the probiotics and help them flourish. This high-powered formula is the ultimate in supplemental probiotic support. 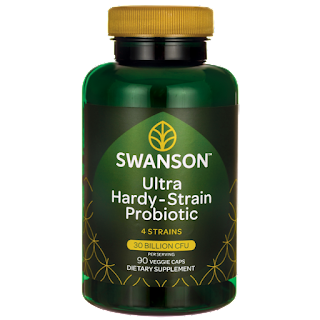 New Swanson Ultra Hardy-Strain Probiotic is a nearly indestructible probiotic that protects beneficial bacteria while providing comprehensive intestinal support so you can feel great from the inside out. Swanson Ultra Hardy-Strain Probiotic features four strains renowned for their outstanding durability: Saccharomyces boulardii, Bacillus coagulans, Bacillus clausii and Bacillus subtilis. Saccharomyces boulardii is a probiotic yeast with the ability to withstand stomach acidity so it can safely reach the lower GI tract, where it supports immune function and protects the beneficial bacteria that facilitate comfortable digestion. The three Bacillus strains featured in the formula are spore-forming bacteria, which enables them to survive at higher temperatures, eliminating the need for refrigeration and dramatically increasing shelf-life. More importantly, the spores protect the organisms from stomach acids, enabling them to reach the lower GI tract intact. Once there, they become active lactic acid producing probiotics, helping maintain a healthy microbial balance for comfortable gastrointestinal function. 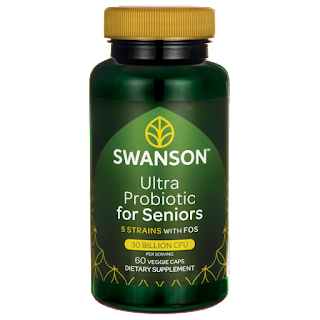 New Swanson Ultra Probiotic for Seniors is formulated to promote regularity and replenish the beneficial bacteria that decline with age. As we grow older, our intestinal environment changes, and that can affect the balance of "good" bacteria that help keep the GI tract functioning smoothly. The right probiotic supplement keeps you feeling great inside so you can continue to do the things you love outside. Swanson Ultra Probiotic for Seniors is specially formulated with a proprietary blend of 5 select strains of probiotics including Bifidobacterium lactis HN019, a trademarked strain clinically studied for its beneficial effects on an aging intestinal microflora and immune system, and Bifidobacterium bifidum, one of the "first colonizers of the human gut" which supports intestinal health. Combined with L. acidophilus, L. casei and trademarked L. rhamnosus HN001, these strains protect and support your GI system. The product packs 30 billion CFU in each two-capsule serving, along with the prebiotic nutrition of FOS to nourish the probiotics and help them thrive. New Swanson Ultra Probiotic for Women is specially formulated to support women's digestive, urinary and vaginal health. The friendly microorganisms known as probiotics are well known for the important role they play in healthy GI tract, but they can also provide valuable support for the urogenital tract as well. A comprehensive probiotic for women helps you feel great from the inside out. 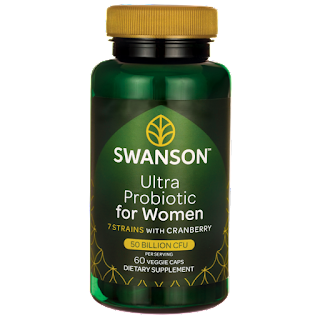 Swanson Ultra Probiotic for Women features 50 billion CFU per serving from 7 select strains. Lactobacillus acidophilus, L. lactis and L. casei combine with standardized whole cranberry fruit to deliver an antioxidant boost while L. gasseri, L. rhamnosus HN001, L. plantarum and L. fermentum promote urinary tract and vaginal health. This formula is the perfect probiotic to suit the unique needs of every woman. 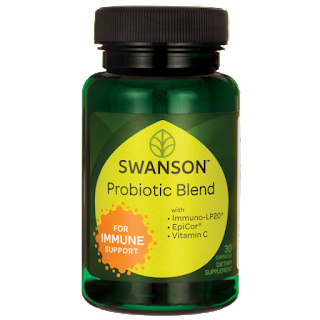 New Swanson Probiotic Blend for Immune Support is specifically formulated with patented ingredients to help support a healthy immune system. Research indicates that over 70% of your immune system is located in your digestive system. With a healthy balance of digestive bacteria, your body's immune system is better able to do its regular job of supporting total wellness. Swanson Probiotic Blend for Immune Support combines the antioxidant protection of vitamin C with the immunobiotic activity of Immuno-LP20™, a powerful nutraceutical made from a heat-killed strain of Lactobacillus plantarum, which promotes immune function through activation of gut immunity. And that’s not all. The formula also includes EpiCor® high metabolite immunogens derived from fermented yeast, which reinforce the immune system to help maintain wellness. It’s an ideal probiotic supplement for defensive support. 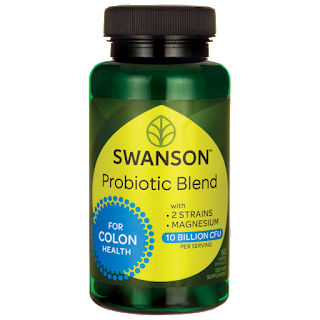 New Swanson Probiotic Blend for Colon Health is specifically formulated to support colon health and help reduce occasional gas, bloating and diarrhea. Probiotics can deliver wide-ranging health benefits throughout the body, but nowhere are their effects more crucial than in the lower GI tract and the colon. A specialty probiotic for colon health will help you feel great from the inside out. Swanson Probiotic Blend for Colon Health combines two probiotic strains that have proven their value for colon health maintenance—Bifidobacterium longum and Lactobacillus rhamnosus—with high-bioavailability GIVOMAG™ magnesium. It’s a great way to support your colon health on a daily basis. New Swanson Probiotic for Daily Wellness helps support general health. When your digestive system runs smoothly, the rest of you does, too. But hectic lives, less than perfect diets, and depleted nutrients in soils can all team up to disrupt the balance of bacteria in your gut. The right probiotic supplement can help this balance by increasing the population of beneficial strains and help you feel great from the inside out. 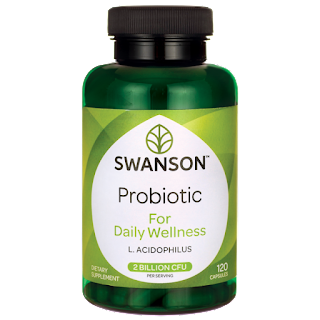 Swanson Probiotic for Daily Wellness features Lactobacillus acidophilus, one of the most researched strains for digestive health. L. acidophilus is also well known for supporting respiratory health, microflora balance and healthy cholesterol levels already within the normal range. Each serving delivers 2 billion CFU, making it a great option for daily wellness. New Swanson Probiotic+ Enzymes for Digestion contains pancreatin to promote optimal digestion. Sometimes the food you love doesn’t love you back. Probiotics are known as the good bacteria that promote healthy gut flora so your digestive system can do its job effectively. Adding digestive enzymes into the mix helps increase the digestive support of the probiotics. This formula is just what you need to keep enjoying—and getting the most nutrition from—the foods you love! New Swanson Probiotic+ Prebiotic Fiber helps support digestive health and promote a healthy microflora. Your digestive system has a huge impact on your overall health. One of the easiest ways to nourish your digestive system is with a probiotic. Probiotics are friendly bacteria that nourish your gut and digestive system. They help break down food and support immune system health. Prebiotics are food for the probiotics to help them survive and multiply in your body. A healthier inside means a happier outside. 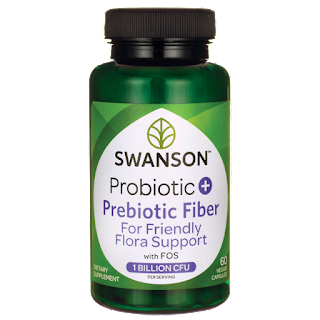 Swanson Probiotic+ Prebiotic Fiber for Friendly Flora Support contains 1 billion CFU of Bifidobacterium lactis, a species that has been well-researched for promoting intestinal and immune health. Along with friendly bacteria, this supplement also contains the prebiotic fiber NutraFlora®. The fructooligosaccharides (FOS) in NutraFlora help create a favorable environment for the probiotics so they can thrive. It’s the perfect probiotic and prebiotic supplement. New Swanson Probiotic+ D for Daily Wellness helps support general health and wellness from the inside out. Probiotics act as good bacteria in your body, which helps support your GI tract. Maintaining this healthy balance of bacteria in your gut promotes optimum digestive health. Vitamin D has surged in popularity for its myriad health benefits, affecting everything from your emotional wellness to bone health. Supporting key systems like your digestive and immune systems is essential for total wellness allowing you to take on every day and live the life you love. 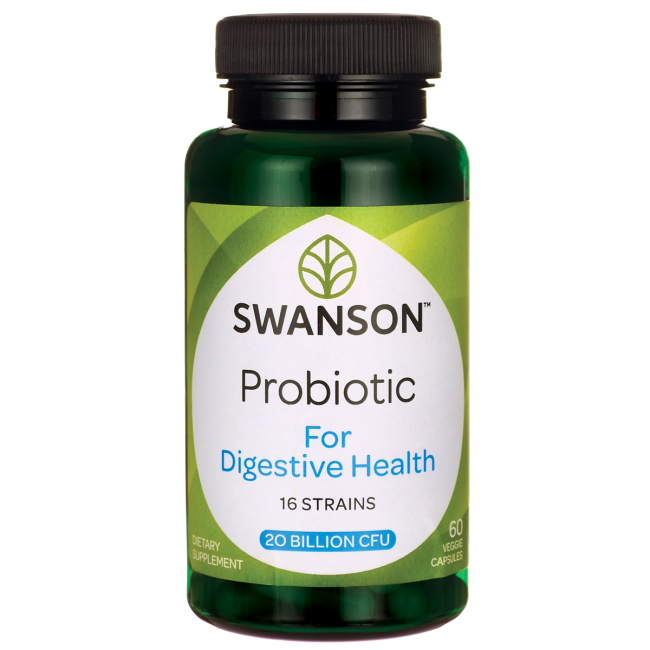 Swanson Probiotic+ Vitamin D features 1 billion CFU of Lactobacillus acidophilus, one of the most extensively researched strains when it comes to digestive health. This formula includes 50 micrograms of vitamin D-3 for additional immune support. Backed by scientific research for supporting immune and digestive health, this formula provides nutritional support in a convenient once-daily capsule. New Swanson Prebiotic helps support healthy digestive microflora. Probiotics are the friendly bacteria that support digestive health, immune health, and more. Prebiotics are food for the probiotics to help them survive and multiply in your body. We’ve got the right prebiotic for your best health. Swanson Prebiotic for Friendly Flora Support feeds the beneficial bacteria in your digestive system so they can thrive. Our prebiotic fiber supplement supplies 95% short-chain fructooligosaccharide (FOS) content to promote a healthy digestive microflora. Studies have shown that just one gram per day of NutraFlora® increases friendly bacteria by over 500% in four weeks. And we could all use more friendly bacteria! New Swanson Probiotic for Kids helps support your child's immune system and reduce mild occasional upset stomach. Living a healthy lifestyle starts from the beginning. Probiotics provide valuable support for healthy digestion, immune function and many other processes throughout the body. Set your children on the path to wellness by providing them with the best probiotics. When you choose probiotics from Swanson, you’ll get the best ingredients so you can feel great caring for the ones you love. Swanson Vitamins new probiotics are just what you need to get your digestive health in check! 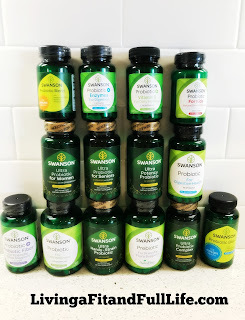 I'm a huge fan of probiotics, that being said I've tried many different probiotics and I have to say Swanson Vitamins new probiotics are some of my all time favorites. I've definitely noticed that as I've gotten older my digestive health doesn't seem to be what it used to. If I miss taking probiotics, which rarely ever happens since I know how important they are for my body I definitely notice a difference. Sometimes it's just bloating but I can definitely tell something is off. My body definitely needs it's probiotics. What I love most about Swanson Vitamins new probiotics line is that they've really customized them so there's sure to be one of a few that are just right for you. 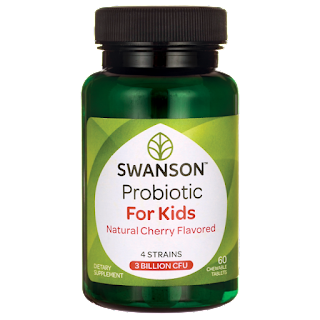 My kids love Swanson Vitamins Probiotic for Kids Natural Cherry Flavored probiotics because they taste good and even they notice that they help their tummies feel better. One of my favorites are Swanson Vitamins Ultra Hardy-Strain Probiotic because they have a high GI survivability ensuring they get to where they need to to be most effective. Whether you're a woman, child, senior or have specific health needs, Swanson Vitamins has the perfect probiotic for you! Swanson Vitamins new probiotics line is absolutely amazing and I highly recommend you all try them out. I guarantee you'll notice an improvement in you digestive health! Click HERE to learn more about Swanson Vitamins! 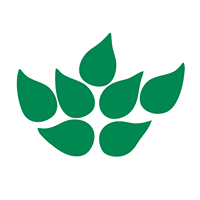 Follow Swanson Vitamins on social media!